It has been very quite here lately....I guess we're all tinkering with the Q4s. 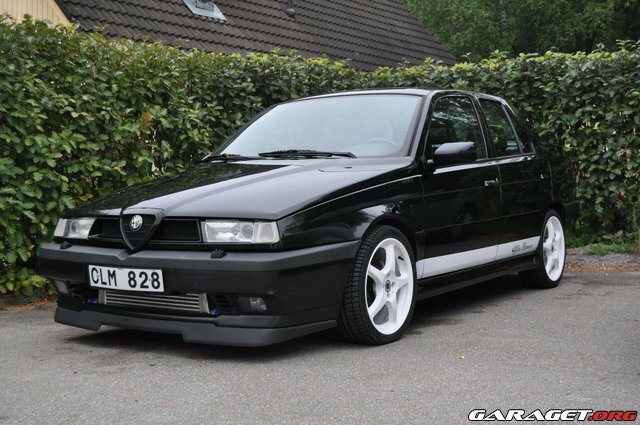 We have this thread on alfa155.org and it is a good way of sharing bits of info. So, for the past week or two my Q4 has been in the garage whilst I am trying to change the steering rack for the new one I picked up a few years back...it is about 20mm too big to be removed easily so all subframe bolts had to come out and the engine lowered after removing the 3 gearbox mount bolts on the left. Nearly done now. Next jobs...get 2 new tyres and fix the oil leak which I suspect is from a loose breather pipe behind the exhaust manifold. For the SZ...changed the timing belt and made a longer bonnet prop. For the JTD...bought a new dual mass flywheel and clutch...EXPENSIVE!!! I bought a lot of tools and am clearing out the workshop. Once that's done, I will be swapping an engine in the 2.5 and do the welding on the 3.0. The other cars will be needing their maintenance in the mean time as well, but right now preparing the workshop is the most important thing on the list. I am in the middle of preparing a new workshop as well! I need more space! After it complete I am going to move my hoist from the old work shop (about 100 meters). In the new location I will have approx 20mx20m of space - enough for my Q4! Speaking of the Q4, It finally wore out the racing slicks that I had bought for it, so I need to get some new ones before I can run the car at Sandown next month, also I have just repaired one of the front wishbone bushes. If people are interested, I will document the process on this site. Yes, please do document it. interior mods: new checkpanel, the clock was shot, AEM wideband installed, Mbquart speakers installed. after that, only racing at the track. I have changed my 2,5 V6 engine in my 166, to a 3,0 V6 with lower mileage, and also the 5 shift gearbox to a 6 shift gearbox. It has just been mapped last week, with a result of 247,6 Bhp at 7047 rpm, and 278,1 NM at 5175 rpm. Then I have had a major cleanup in my workshop - new painting, new relocation off all the stuff in the shelfs - so now the workshop is nice clean and tidy - and ready to my 75 3,0 V6. The 75 is going to be transformed into a rally/race car. I will use the winter on this quite lowbudget project. Oh - and by the way - my Q4 is still at the bodyworkshop, waiting to get rid of all the damned rust. I went down into the garage, checked all the levels and started her up for the first time in 6 months. Started on the first twist of the key. Just need to get new clutch master and slave cylinders. And from the sounds of it a new water pump. And due to the fact the cambelt hasn't been changed in 6 years, but less than 1000 miles, I better get that changed as well. Still at least it started on the button, and made good oil pressure. Tried to quickly swap the turbo in front of the house, concluded it's not a 1 hr job and put it back on. Checked every connection and hose I could find, fixed a few, went for a test drive. She's better, but still low on oil pressure when she warms up and lacking power over 4000 rpm. I guess I have to take her to the workshop and swap the turbo there. Whizz....is this on a Q4? If so, didn't know you had one - thought you were a V6 man...? As for my car..I got a couple of Uniroyal Rainsport 2s fitted. Next job is the home full body respray....lots of potential mishaps due along the way! Noticed you'd been a bit secretive about a car on 155.org. I have indeed acquired my very own money pit in the classic color AR130 multi-rosso. Sssh! She needs TLC before I can drive her around so I'm not announcing her yet. That's torn it...your wallet that is! Other than that, I put a spring on the brake bias valve, scraped rust and loose bottom protection off, welded the right footwell protector back on, put fertan on all the spots and after that epoxy primer. I hope to start her again tomorrow, let's see if she's at least fit enough to get a test so I can start gathering bits to build a fresh engine without being in a terrible rush. I have already sourced a good head with the 155 BHP atmospherical cams in it. Last edited by WhizzMan; 10-09-10 at 20:32. Tried to get her home today, decided against it, too much noise from at least one big-end. Engine swap on my blu spazio V6. The old engine is out, the new one already has a dry tensioner and a fresh belt on it. Tomorrow I'll move all ancillaries and the gear box etc. to the new engine, probably hoist it in the car again and see how far I'll get hooking it up again. Drove the fist few meters with the spazio. It's still SORN so only on private property, but it was good to be behind the steering wheel once again. She still needs a list of things done before I can MOT her again, but I'm confident I can have that done before october 1st, which is when I plan to put her back on the road. After that it's more cleaning out the workshop, so I can do more cars without having to "borrow" my workshop buddies' lift. Today I checked both rear calipers for movement - they both seem fine. Also checked and re-adjusted the rear brakes compensator which also seemed OK. I used the 5KG weight as described in the manual plus a bit more. Something is not right though as after a 4 mile drive and normal braking from 30 or 40mph one rear disk I could touch and keep my finger on - was not warm at all. The other was hotter but could still keep my finger on it for a few seconds, also both are rusty which is what prompted me to check them. I saw that the arm was moving on the compensator but didn't think to check the little piston it pushes against - I will do so tomorrow. At the moment it is sticking out about 10mm or so.